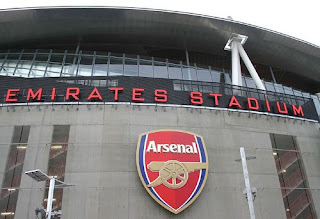 Akhil From Hounslow: What Is A Good Season For Arsenal? What Is A Good Season For Arsenal? Today's blog is short and simple. What is a good season? Is the Carling Cup and a top three finish enough this season? What about going for the FA CUP too? Where will we finish in the league? What about the Champions League? Some people have suggested going out and concentrating on domestic matters is not the worst thing? What would you be happy with in terms of all four competitions? We should remember the Carling Cup is far from won, i know some people have said that it is in the bag and the bookies will agree, but we should not lose focus and certainly not count our chicken's before they have hatched. Also, with the transfer window coming up, is there anyone you would let go or anyone specific you would try and buy or loan? Do leave your comments in the comments field as most people I have spoken to are talking about these subjects. Apart from that, stay safe in the festive period, be careful in these conditions but at the same time have a very Merry and Happy Christmas. Well, after the last few years we have had, i.e not winning anything, progression is needed. so the season you said may be the springboard for something bigger the season after. maybe? yea being 2nd in the league compared to third in a non world cup year means you don't have to qualify too right? third and fourth this year have to go through that qualifying round before the group stages, so being 2nd rather then 3rd is a massive difference. I agree, big season for Clichy. Will be interesting to see Gibbs more because i think to play behind AA23 is a tough task, also would be interesting to see Clichy play behind Nasri or Rosicky of someone that tracks back a bit. AA23 has improved though but still can be seen wondering at times. Good run in FA CUP is something we MUST go for in my opinion. We are Arsenel FC and winning the league or CL will be a good season, anything else you would have say an average season, considering we've finished top 4 season. We actually have the squad to achieve our goals, but tactically we are not flexible enough. The other cups are nice. That is all. Nice but progression? I know what you mean, but does it happen over night? i know some would say, well its not over night because its taken 5 years, but you know where im coming from. league is there to be won though, it was last year too...so can see what your saying. Arsenal must bag a trophy in order for it too be a good season, although only a Carling Cup triumph wouldnt be enough. Champions league....yeah i agree, and getting drawn against barca dont help! Id love the league, i want the league more then the Champions league, i know for Mr Wenger, its all he has yet to win but the league is the league, thats what i want first. In such a competitive league, so many teams can win the league and winning it will be special. There's a great line from Alan Davies in his podcast. He says "don't expect anything, you get what you're given." And I reckon that's spot on. To expect to win a trophy every season, no matter what team you support, is wishful thinking. As long as we're competitive, then I'm happy. Nice point Bradley. I think we have been spoiled. Under Mr Wenger, certainly in the early years, league titles, FA CUPS, Uefa cup final, FA cup finals, League cup final, Champions league final, we are used to it so not to get it is hard to accept. Great point and glad someone brought it up. nice one. league and a cup? so CCup and league in other words? id take that!! i agree on big games, as a supporter, to keep paying these high prices then losing them its very frustrating. Yup a trip to Wembley and a win, would certainly put some belief in the minds of players, staff and fans. Would be nice to play barca with our best 11 too. Unlike going to spain with 6 players not with us. What I'm trying to say, is that since George started winning trophies and then Wenger became our greatest manager of all time, Gooners have almost developed a sense of entitlement to winning things. It's good to have the attitude to want to win, but only one team out of almost 100 league teams can be Premier League champions, so there's no great shame in not winning every year. CC and FA cup would breed, as said before, a winning mentality. CC is our only realistic chance of silverware in my honest opinion. CL would be akin to a degree with honours. Barca is the hardest test. I'd not sell in January. End of the season I would sell RVP(fitness) Clichy (Although he works very hard without much help from AA, his form has declined,without signs of it returning.Theo, unless he gets his chance centrally where he really could shine. On the wing he often fails to control the ball fast enough, gets caught in possession and fails to supply quality crosses regularly. AA sadly as he's not cutting it nowadays. This season will be tougher than many think. Especially with all these "scared to loose" Rumours being voiced. Give me top four this term and I'll be relieved not happy. Keith, loved reading your comment, even though im to young to remember or even be around when we won the littlewoods cup, i know exactly how important it was. It was no small trophy. and again what you have described is progression. Having been going to watch arsenal for quite a while, older fans often tell me we have it good and try being around in the 70s and early 80s etc. I do think the CC could lead to bigger and better things. It is ours to lose BUT lets not take it for granted. Peter, yeah selling in Jan is always risky because it may come back to haunt you (if you get injuries or loss in form etc). I do agree with Dilshan (above) who thinks its a big 5 months for Clichy, RVP etc and even aa23. A new contract is being talked about and talks are on going so they all have something to prove. Top 4 is always a must. but i think so is the CC at least. but we wont win anything w/ this defense/manager. thanx! perfect discussion points(questions)the editor is happy n if u need any kinda of help i'm free!! Not even a Carling Cup? Is that a good season generally or a good season for arsenal in this situation? certainly at the back we always seem to have a mistake in us. Good season: 2nd, CC or FA cup. haha love your shocking season!! nicely put. Id take good season...! A good season would be to win Silverware, people saying a good season would be to win PL or CL, which is unrealistic. Arsenal lack the mentality to win big games, like Cesc said yest their to afraid of loosing in those games. Its the same story every season do well keeping in touch with the likes Of Chelsea and UTD then at the final hurdle always fall. Cruise threw the group stages of CL and get embarrased when it comes to playing the big boys in the knockout stages. Defence is no way near good enough, i was listening to a podcast yest and they described Arsenal as a team for next year, its always next year they'll challenge, its always next year they'll be good enough, thought that was quite accurate/ I don't know whether Arsene realised its this season or not. If Barca come calling again for Cesc ( and i know they haven't got the funds and have their debt to pay ect) but if we win nothing again this season and they come for him again I cnt see him staying. Had Wenger gone out this summer bought a keeper a good CB even Gary Cahill or someone great in the air good with his feet, doesn't need time to adapt played in PL ect, but instead he buys Koscielny, played in top flight French Ligue 1 for one season before moving to Arsenal yet wenger thinks the guys going to be ready to play at Top level premier league and CL, its unfair on Koscielny because he needs time but the situation the clubs in fans won't give him time we haven't got time for players to adapt.I Feel sorry for the players because he believes so much in them when in truth they are not good enough, not their fault. Players like rosicky, djourou(even though hes been ok this season) almunia, bendtner, denilson there average players, there not good enough to win PL and CL.I told you at the beginning of the season id be happy if we only won Carling Cup because we aint good enough to win league or CL, i think its gona be worse this time against Barca think even with a stronger team because we had no spine last season against Barca, had no gallas vermaelen cesc RVP ect they gna embarass us even more. no matter who we play whether its UTD or Wolves or West Ham or whoever you never feel safe as an arsenal fan. No matter who we play we'll give them chances to score. Midfield don't work hard enough.I thought last season Song was just as important as Cesc and Vermaelen, but you see in the big games he doesen't command the midfield, he doesent control it and break the play up aswell as he does against the lesser teams. Chamakh has been great this season, he presses and works harder then any of the front men. he's more of a target man that can hold the ball up and bring our wide men in to play and contribute every now and then with a goal, but he's not a natural goalscorer, need another striker. You more then anyone know my views on Andrey so i wont bother starting their. Clichy makes ridiculous mistakes which just keep becoming more and more frequent in his game, cnt wait for Gibbo to have an injury free run to take Gael place. Wenger has to buy in Jan there's no other way about it, you want to hold on to your best players like Cesc you have to match his ambition to win, told you he's looking at players like Messi and Pique boys he grew up with in Barca's, La Masia and he seeing all his mates win La liga's and winning every trophy there is to win in football and CL,and Fifa World Club Cups you name it they won it. With our current squad they are not good enough. Another thing we havent got the players to adapt to different tactics, Arsenal only know one way of playing when that doesent work were basically screwed. So easy to play against us just congest the middle sit behind the ball be disciplined, force us out wide and let us cross the ball, and play on counter happens in all the big games. I can just keep going on and on about where its all wrong!! rar man! paragraphs! i lost my way 3 times! Btw, Barca do have the money now perhaps because of that shirt deal with Qatar or whatever, that's given them a sort of injection. Agree about defensively being the shambles. The bit when you said 'you never feel safe as an arsenal fan' is very true.So many games this season Ive felt uneasy...west ham at home, fulham home, bham home, only the early games like blackpool and bolton and braga and shahkter i felt safe. Everton and wolves away other two where it felt uneasy. Only really City away i felt like we were comfortable but saying that, they did have 10 men! The podcast was Sunday supplement, i heard same thing. They were talking about goalkeepers and Oli Holt said that maybe szch is the right man but needs a season to get used to it hence the year early. As for barca, well....for us to have even a small chance, they need to have a off day. In the CL, there's no expection, maybe some hope but certainly support as always. I think all the players you mentioned as not being good enough...are NOT first team players, they are squad members. I think as squad members they are okay. Almunia (quite sure he will move soon) but Djorou and Denilson have played well when selected but are more squad members. Clichy, we will only know once gibbs has a run in the team. Im keen to see gibbs because if he makes some mistakes then im convinced its a mental issue because they know AA23 doesn't track as much so they are in two minds in to follow their man or go to the ball, as that's usually the dilemma Clichy has. Big games thing needs to change. Giving 6 points each to chelsea and utd every season means we wont win the league. that's just to much. Cant put my finger on why we keep losing because usually we play quite well but i guess we just don't take our chances in big games. that MUST change...starting Monday! I cant remember what else you wrote because you wrote alot! but thanks for your comment mate. I too will take the Carling Cup and a top 4 finish but 2nd would be nice as we will not have to go through them qualifiers. OK out of our first 11 how many players would get in UTD,Chelsea,Barca or Madrid's first 11? But that is the flaw in the argument because your saying to say we can win the league or CL is unrealistic but then your compared us to the teams that will win the league or CL. I don't compare our team to there's because they are better then us plus...we spend a lot less. we don't have roman to fund us, we don't spend as much as barca and madrid (and in the process get into debt) we aint spent 30m on players every season, how can you compare us with them at this time. Maybe when the emirates is paid off or when the new law comes into action in 2012, then maybe we can compete with these teams but to compare our team to there is as unrealistic as us winning the champions league. so only really maybe Vermaelen when fit would go into one or 2. Cesc off course, maybe Chelsea would take nasri. maybe sagna. i don't know really but its unrealistic to even think about that. Not A Bad Way To End The Year At The Emirates!